Easily create a fogging system using our Netafim heads. The Netafim assembly provides water efficient, uniform fogging coverage for humidifying or cooling applications and is easily adaptable to any greenhouse. Requires Hanging Assembly, 1/2" Mounting Adapter, or the Dan Retrofit Adapter (ordered separately). Hanging Assembly for use with Netafim Sprinkler, Mister, or Fogger Assemblies. Used for mounting to standard PVC pipe. Used to connect Netafim Assemblies to Dan fittings. I have only been using them about a month so time will tell. I use them for softwood cuttings. They are truly drippless on start up & cut off. They put a fine mist on leaves that does not run off. Works beautifully and off normal water pressure so no need for expensive pumps and peripherals. Very affordable and does a perfect job. This is a great little product. Sometimes the little red pin needs help on the first try but after that I have had no problem. This is a great product for greenhouse use. It puts out just the right amount of moisture to cool and water small potted plants. Works great. Creates a nice fog for cooling and humidity control. I bought two of these foggers with purple pin and put them a few feet in front of a large fan in the apex end wall of my 20'x24' double-wall polycarbonate greenhouse. I have them turn on every 5 minutes for 1 minute using a Digg 6 -zone valve controller. This controller is perfect for fog cooling the air because you can hook a standard thermostat to it so that a given zone will only be active when temperature reaches a given point. So when it gets hot enough in the greenhouse the foggers come on an the cooling mist is blown all over the house and cooling the plants. Tomatoes yield more, etc. I'm ordering two more today because they have a tendency to fly off their friction-fit nozzle when they turn on sometimes and get lost. They do the job though and are cheap for what you gain. Installed 10 of these in a 32 foot by 32 foot solar greenhouse. Fans were not doing the job. Outside temp was 95 deg, inside roof at 12 feet was 125 deg and at plant level it was 105 deg. Turned the misters on and in 5 min temp was below 100, at the end of one hour the temp at the 3 foot level was 75 deg. The misters were installed at 6.5 feet. The temp above misters was down to 105 deg. I now put the misters on a temp control system which turns them on when the temp gets to 88 deg and off at 83. Only runs for about 5 min every 30 min. A lot better than a $2000 worth of swamp coolers. My total costs was less than $200 with thermostat and inline valve and misters and piping. 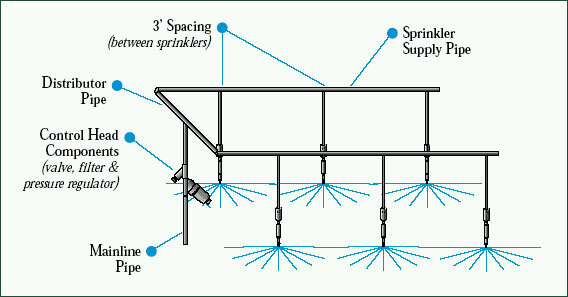 The fogger assembly, when setup in the correct pattern, provides the right coverage needed for keeping cuttings turgid. 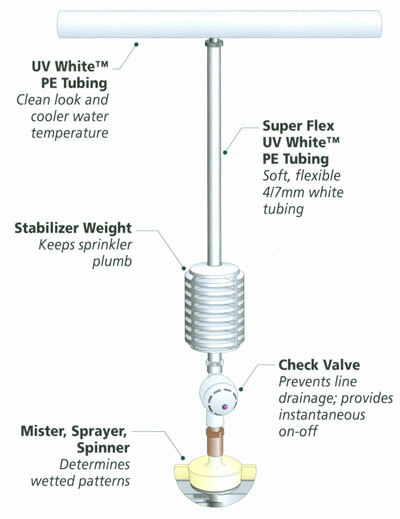 The mist is gentle while the check valve (included) eliminates all chances of dripping. With no tools required to clean the fogger heads this fogging assembly is simply a no brainer. A great product from a great company.